Put several linguists together on a project such as PanLex, and they will discover many a word mystery that travels a long and dusty road. 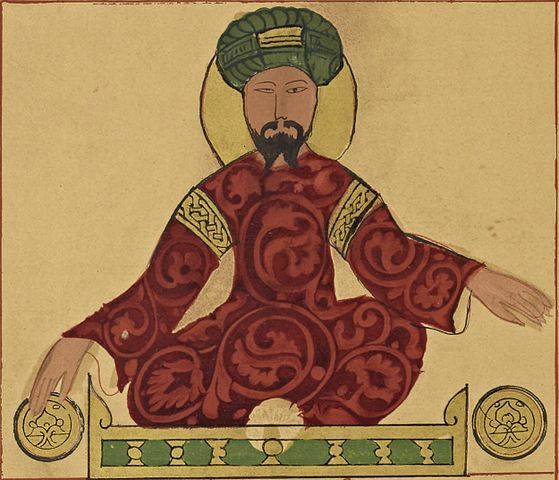 Such a word sleuthing opportunity came up recently regarding the etymology of the name of Saladin, the 12th century sultan of Egypt and leader against the Crusaders. We first established that Saladin’s name in Arabic is صلاح الدين (Ṣalāḥ al-Dīn), literally “The Righteousness of the Faith”. The Arabic word دين (dīn) “faith, religion” reminded us of the Yiddish word דין (din), meaning “religious law”. Was this a coincidence? As it turns out, no — the Yiddish word was borrowed from Hebrew דין (dīn). Hebrew and Arabic are related languages, belonging to the Semitic family, and these words come from the reconstructed Proto-Semitic root *dyn. There is evidence for this root as far back as Ugaritic 𐎄𐎐 (dn), over 3000 years ago. Words deriving from it usually have to do with “law” or “judgment”. Interestingly, we found that Persian, an Indo-European language distantly related to English, also has the word دین (din), which according to the PanLex database means “religion”. The most obvious explanation for this would be that Persian has borrowed the word from Arabic, as Persian has taken on many words of Arabic origin since the spread of Islam. However, upon further digging, we found that it is actually a descendant of Middle Persian dēn, which came from the ancient Avestan word 𐬛𐬀𐬉𐬥𐬁 (daēnā), meaning “insight”. The fact that the modern Arabic (dīn) and the Persian (din) are nearly phonetically identical turns out to have been a coincidence — the Semitic root and the Persian root arose in different places at different times. However, it is likely that the semantic shift of the Arabic word from its original meaning of “judgment, law” to “faith, religion” came about when Arabic came into contact with Persian after the Islamic conquest of Persia in 651 C.E. At this point, we looked into the origin of the ancient Avestan word and discovered that it descends from the Proto-Indo-European root *dʰei̯H-, meaning “to look over, consider”. This root is the source of the Sanskrit word ध्यान (dhyāna) meaning “contemplation, reflection”, which, like in Persian, took on religious overtones in Hinduism to mean “profound, abstract meditation”. This concept spread to Buddhism under the name झान (jhāna) in Pali, the holy language of Buddhism and a descendant of Sanskrit. Chinese Buddhist monks borrowed the word as Middle Chinese 禪 (dzyen, modern Mandarin chán) to refer to a new kind of meditative practice they were developing. This spread to Korea, where they called the practice 선 (seon), as well as Japan, where it became known as Zen. These long and dusty roads therefore traveled both a Semitic route and an Indo-European route, coming to an unexpected intersection of sound and sense. It’s amazing to think that the name of one of the most famous personalities from the time of the Crusades as well as a term used often in modern Jewish religious schools in New York City would have a connection to Zen Buddhism practiced on the other side of the globe. While PanLex’s mission involves overcoming the barriers between languages, and our focus is primarily on allowing the speakers of modern spoken languages of the world to communicate with each other, we do not restrict ourselves to just the languages of the present day. Our database also contains lexical data from hundreds of historical, classical, and even reconstructed languages. 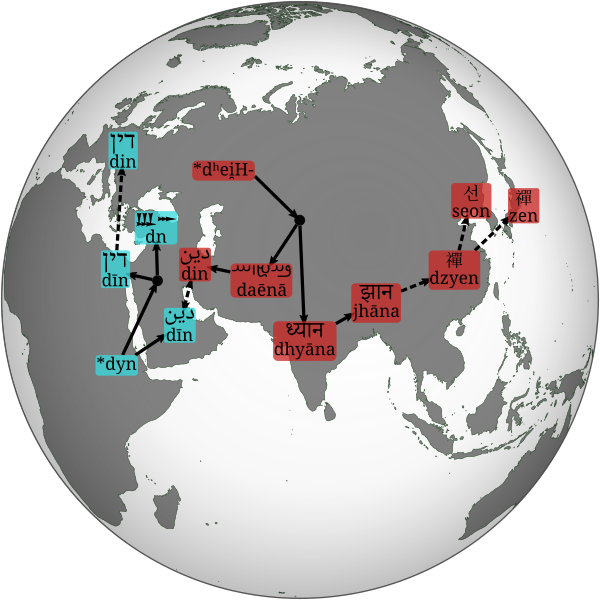 Due to the nature of our inferred translation system, these ancient languages can be translated into and out of the huge variety of modern languages present in our database. Using the PanLex database has helped our team immensely in the discovery of the connections between words like those above. We wish to expand our coverage to an even greater level. We have discovered and catalogued dictionaries in languages as disparate as Classical Mayan, Sumerian, and Old Norse, and with public support, we will be able to ingest them and make the data interoperable. This will enable users of PanLex’s tools to translate words from ancient texts to an even greater extent, finding intriguing insights into the past and using history to discover more and more connections between the peoples of today.